"We cast one shadow ray per primary or diffuse ray, and two random diffuse rays per primary ray. The diffuse rays are used to compute both one bounce of indirect irradiance and environment irradiance, which are processed with a bilateral ﬁlter [TM98] to eliminate noise." "There are two light sources: a point light (the Sun) and a hemispherical one (the sky). I use Monte Carlo integration to compute the GI with one bounce of indirect lighting. Nothing is precomputed (except the massive model data structure of course). 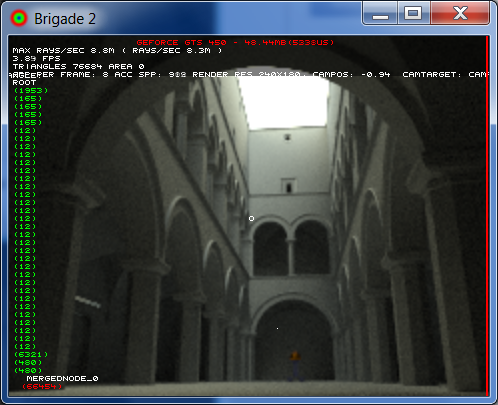 "By using LOD voxels, signiﬁcantly higher frame rates can be achieved, with minimal loss of image quality, because ray traversals are less deep, memory accesses are more coherent, and intersections with voxels are free, contrary to triangles (the voxel ﬁlls its parent node, therefore, the intersection is equal to the already computed intersection with the node). 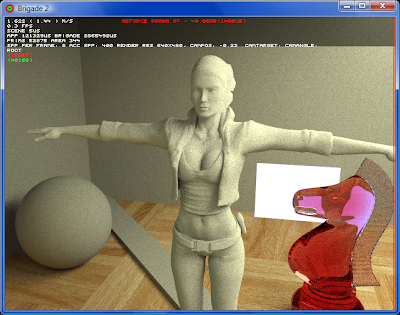 Furthermore, the LOD framework can also reduce the amount of aliasing artifacts, especially in case of highly tessellated models"
All the ray tracing is currently CPU based (the GI algorithm runs at 1-2 fps on a quad core cpu), but it would probably run in real-time at much higher framerates when implemented entirely on the GPU. 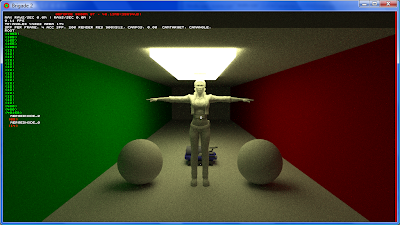 - there is a new downloadable demo showing off the Blinn shader (Fermi only). I haven't been able to test it yet, but the screenshot looks sweet! There should also be a playable Reflect demo up by tomorrow! 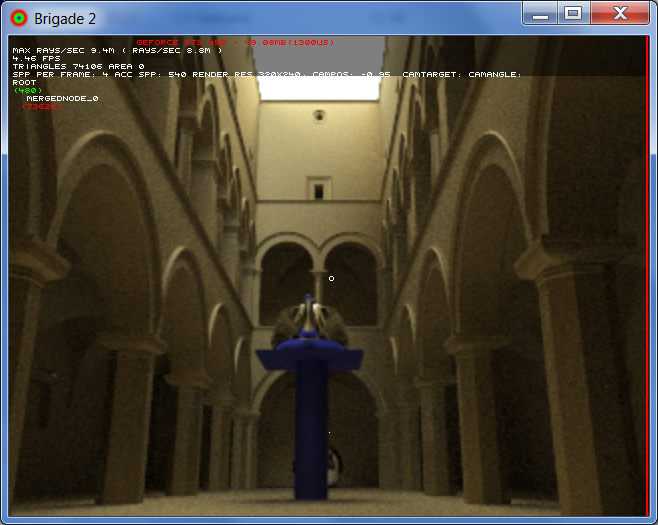 Real-time path traced Sponza fly-through on 3 GPUs! 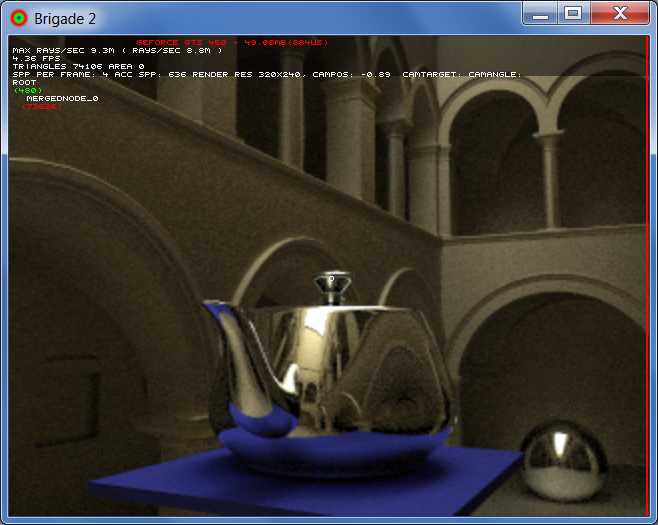 I've sent the executable of the teapot in Sponza scene to a friend, szczyglo74 on Youtube, who has a much more powerful rig than my own (a PC with 3 GPUs: 1 GTX 590 (dual gpu card) + 1 GTX 460) and who made some very cool real-time videos of the sponza scene. Many thanks szczyglo! The above videos clearly show the importance of the number of samples per pixel per frame in indirectly lit areas: despite the low max path depth of 4, it is still possible to discern some details in the corridors in the first two videos (32 spp per frame) during navigation, while the last two videos (8 and 4 spp per frame) are obviously too dark in these regions, but clear up very fast with a stationary camera. 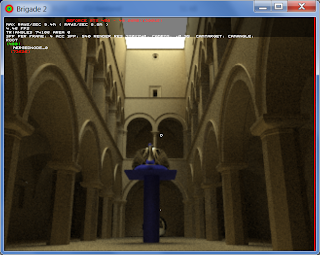 Note that these tests were made with a kernel that is not optimized for indirect lighting (no multiple importance sampling is used here). I'm quite happy with the sense of photorealism in these videos, especially when you consider that this is just brute force path tracing (no caching, filtering or interpolation yet nor anything like image reconstruction, adaptive sampling, importance sampling, bidirectional pt, eye path reprojection, ... which are all interesting approaches). 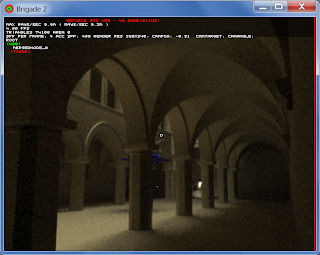 A textured version of Sponza will probably further increase the realism, which is something I will try in a next test. 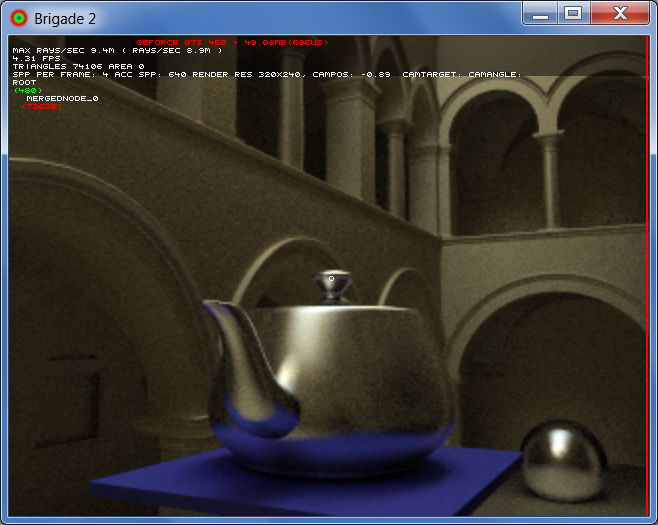 I've managed to get the "teapot in Sponza" scene to render slightly faster by treating all objects in the scene as static. It uses progressive spatial caching and runs pretty fast despite being CPU-based. The Sphere flake tracer uses a cool looking frameless rendering technique, roughly comparable to frame averaging. "Hair Ball" and "Terrain Ray Marching" are awesome as well. This is a particularly nasty scene, since all the light is coming from the skydome through the narrow roof (no portals or importance sampling are used, max path depth is 4). Nevertheless, it still converges rather quickly on a GTS 450 using the motion blur trick. It's amazing what such a simple trick can do to the quality of the image, without losing any detail. My next test will involve a 3rd person car camera like the one in http://www.youtube.com/watch?v=SOic3eE8wrs which should work really well in combination with the motion blur (no sudden sideways movement). "Practical noise reduction for progressive stochastic ray tracing with perceptual control"
The "supplemental.zip" folder contains some very nice comparison videos. The video was rendered on a low end GTS 450. 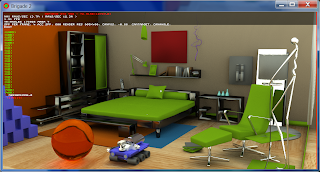 The scene is inspired by and meant to be a real-time remake of an animation rendered with GPU path tracing using SmallLuxGPU (last scene in the video). Today I've added cheap camera motion blur to the Brigade 2 path tracer using the OpenGL accumulation buffer. 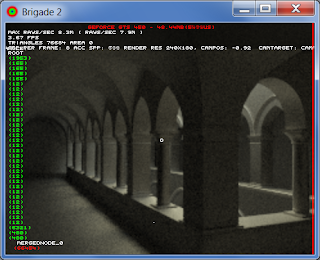 The technique blends the pixels of one or more previous frames with the current frame and works very well for real-time path traced dynamic scenes, provided the framerate is sufficiently high (10+ fps). 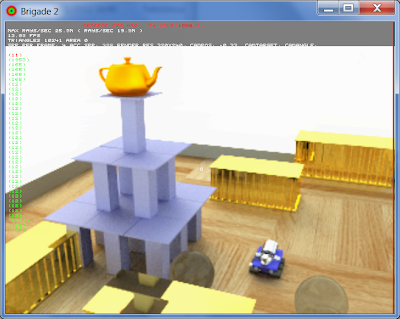 The difference in image quality is huge: path tracing noise is drastically reduced and since all calculations pertaining to the accumulation buffer are hardware accelerated on the GPU, there is zero impact on the rendering performance. Depending on the accumulation value, you essentially get two to ten times the amount of samples per pixel for free at the expense of slight blurring caused by the frame averaging (the blurring is actually not so bad because it adds a nice cinematic effect). I'll upload some videos of the above tests soon. It looks very impressive and pretty. 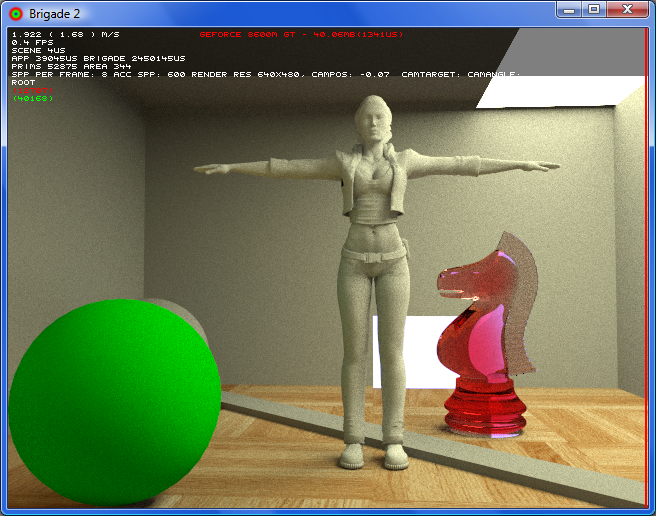 The path tracer owes its speed to the fact that it is completely running on the GPU and to a custom precomputed hashing algorithm. More info at http://bertolami.com/projectView.php?content=research_content&project=real-time-path-tracer There are also downloadable executables further down the page. 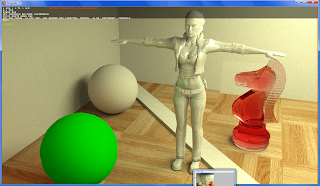 Tokaspt (by tbp), Sfera (by LuxRender's Dade), the WebGL path tracer (by Evan Wallace), ... the list of real-time GPU path tracers featuring dynamic scenes with spheres keeps growing. These scenes use Brigade's multiple importance sampling kernel which drastically reduces the noise in interior scenes compared to the kernel used in previous test scenes (which converged fast because those were open outdoor scenes lit by an HDR skydome). Brigade's MIS algorithm allows this kind of interior scenes to converge extremely fast as can be seen in this video made by Jacco Bikker. It uses two GTX 470s to render at real-time framerates with 80 spp per frame! 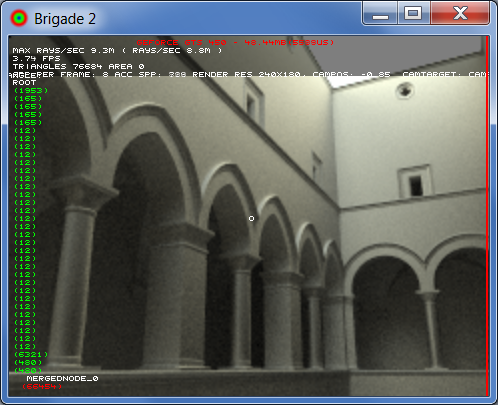 Great news today: the website for the Brigade 2 path tracer has been launched and includes the source code so anyone can make their own real-time path traced game. The path tracing kernels are still closed source and precompiled in a library. 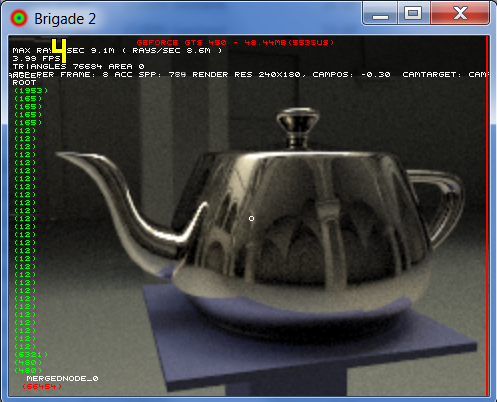 Expect many more demos made with the Brigade 2 path tracer in the coming weeks and months. 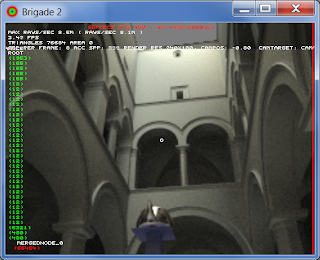 Brigade is also going to be ported to OpenCL soon. 2012 is going to be a breakthrough year for real-time GPGPU path tracing. The scene contains 110k triangles (the chair and robot are free models found on the net, the ogre is the same model from the previous demo). It renders in real-time at low resolution on a high end GPU and is pretty amazing to see in action. Videos and executable will follow soon. I think megatextures could help, but still fundamentally there are things you cannot solve with our current shadow meshes. And until the performance supports real-time ray tracing and global illumination, we're going to continue seeing hack after hack for rendering shadows. HC: Voxels are very very interesting to us. 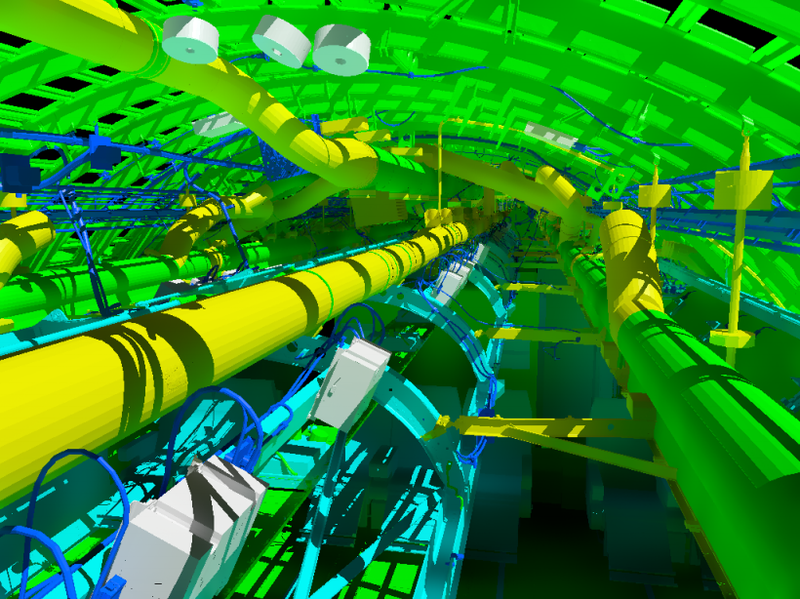 For example, when we take advantage of voxelization, we basically voxelize our level and then we build these portalizations and clustering of our spaces based on the voxelization. And so voxelization, what it does is hide all the small geometry details. And in the regular data structures, it's very easy to reason out the space when it's voxelized versus dealing with individual polygons. 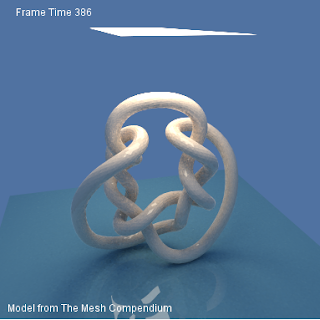 But besides this ability, there's also the very interesting possibility for us to use voxelization or a voxelized scene to do lighting and global illumination. We have some thoughts in that area that we might research in the future, but in general I think it's a very good direction for us to think about; to use voxelization to hide all the details of the scene geometry and sort of decouple the complexity of the scene from the complexity of lighting and visibility. 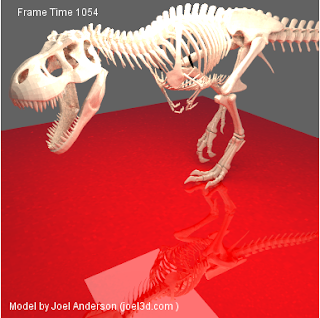 In that way everything becomes easier in voxelization.